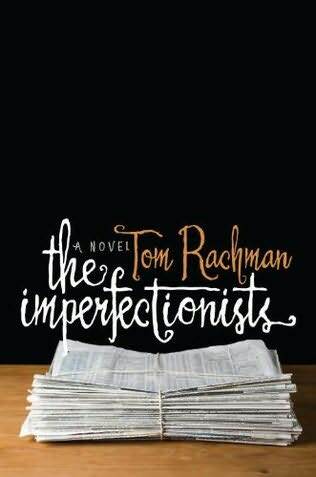 OOH FANCY THAT: .. the imperfectionists, tom rachman ..
.. the imperfectionists, tom rachman ..
"I grew up in peaceful Vancouver with two psychologists for parents, a sister with whom I squabbled in the obligatory ways, and an adorably dim-witted spaniel whose leg waggled when I tickled his belly. Not the stuff of literature, it seemed to me. During university, I had developed a passion for reading: essays by George Orwell, short stories by Isaac Bashevis Singer, novels by Tolstoy. By graduation, books had shoved aside all other contenders. A writer--perhaps I could become one of those. There was a slight problem: my life to date. By 22, I hadn't engaged in a bullfight. I'd not kept a mistress or been kept by one. I'd never been stabbed in a street brawl. I'd not been mistreated by my parents, or addicted to anything sordid. I'd never fought a duel to the death with anyone. It was time to remedy this. Or parts of it, anyway. I would see the world, read, write, and pay my bills in the process. My plan was to join the press corps, to become a foreign correspondent, to emerge on the other side with handsome scars, mussed hair, and a novel. Years passed. I worked as an editor at the Associated Press in New York, venturing briefly to South Asia to report on war (from a very safe distance; I was never brave). Next, I was dispatched to Rome, where I wrote about the Italian government, the Mafia, the Vatican, and other reliable sources of scandal. Suddenly--too soon for my liking--I was turning thirty. My research, I realized, had become alarmingly similar to a career. To imagine a future in journalism, a trade that I had never loved, terrified me. So, with a fluttery stomach, I handed in my resignation, exchanging a promising job for an improbable hope. I took my life savings and moved to Paris, where I knew not a soul and whose language I spoke only haltingly. Solitude was what I sought: a cozy apartment, a cup of tea, my laptop. I switched it on. One year later, I had a novel. My plan – all those years in journalism--had been a blunder, it seemed. The writing I had aspired to do was beyond me. I lacked talent. And I was broke. Dejected, I nursed myself with a little white wine, goat cheese and baguette, then took the subway to the International Herald Tribune on the outskirts of Paris to apply for a job. Weeks later, I was seated at the copy desk, composing headlines and photo captions, aching over my failure. I had bungled my twenties. I was abroad, lonely, stuck. But after many dark months, I found myself imagining again. I strolled through Parisian streets, and characters strolled through my mind, sat themselves down, folded their arms before me, declaring, "So, do you have a story for me?" I switched on my computer and tried once more. This time, it was different. My previous attempt hadn't produced a book, but it had honed my technique. And I stopped fretting about whether I possessed the skill to become a writer, and focused instead on the hard work of writing. Before, I had winced at every flawed passage. Now, I toiled with my head down, rarely peeking at the words flowing across the screen. I revised, I refined, I tweaked, I polished. Not until exhaustion--not until the novel that I had aspired to write was very nearly the one I had produced--did I allow myself to assess it. To my amazement, a book emerged. I remain nearly incredulous that my plan, hatched over a decade ago, came together. At times, I walk to the bookshelf at my home in Italy, take down a copy of The Imperfectionists, double-check the name on the spine: Tom Rachman. Yes, I think that's me. In the end, my travels included neither bullfights nor duels. And the book doesn't, either. Instead, it contains views over Paris, cocktails in Rome, street markets in Cairo; the ruckus of an old-style newsroom and the shuddering rise of technology; a foreign correspondent faking a news story, a media executive falling for the man she just fired. And did I mention a rather adorable if slobbery dog?"